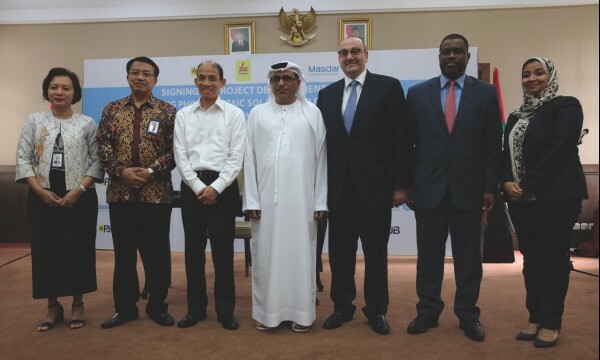 Abu Dhabi-based renewable energy company Masdar, Indonesian power company PT Pembangkitan Jawa-Bali (PT PJB) and Abu Dhabi Future Energy Company have signed a project development agreement (PDA) for 200MW floating solar plant. The floating solar plant will be located on an area equal to 225 hectares atop the Cirata Reservoir in the West Java province of the country. The reservoir has an area of 6000 hectares and already powers a 1GW hydroelectric power station. The planned solar project will be mounted on 700,000 floats moored to the bed of the reservoir and connected by electric cables to an onshore high voltage substation. Apart from generation clean power, the solar panels can also be beneficial by preventing the evaporation of water from the reservoir, while limiting the growth of algae. Signing of the PDA follows the MOU signed between PT PJB and Masdar this July to collaborate on finding sustainable solutions to Indonesia’s increasing energy demand. The focus has mainly been on projects in and around the Java-Bali and Sumatra regions. Indonesia is the largest country in the Association of Southeast Asian Nations (ASEAN), with a population of more than 250 million. The country has a target of meeting 31% of its electricity needs from renewable sources by 2050. As per the International Renewable Energy Agency (IRENA), Indonesia has the potential to produce over 700GW of renewable energy, including 532.6GW of solar power. PT PJB president director Iwan Agung Firstantara said: “PJB is excited and looking forward to working with Masdar. Image: Officials of PT PJB and Masdar at the signing ceremony. Photo: Courtesy of Masdar.